In studio with "The Stravinsky Project"
The Stravinsky Project is right around the corner and everyone in the building is especially curious about how the new work, (also titled) The Stravinsky Project is going to look. The piece is a collaboration between Choreographers Jamey Hampton and Ashley Roland (BodyVox), Rachel Tess (Rumpus Room Dance), OBT's own Anne Mueller PLUS original live electronic music composition by Heather Perkins (Water Dog Studio) and costume design by artist and professor Morgan Walker (PNCA). Oh right, and it is set to Stravinsky's music. That's one doozy of a collaboration. Here are some peeks at how this has been playing out in the studio. 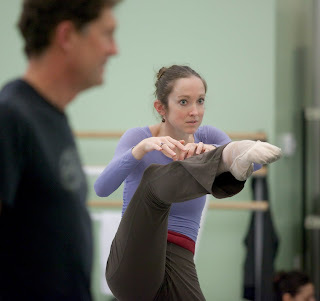 Candace Bouchard and Lucas Threefoot in The Stravinsky Project rehearsal. Photo by Blaine Truitt Covert. 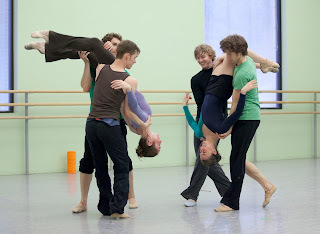 Lucas Threefoot and Christian Squires in The Stravinsky Project rehearsal. in The Stravinsky Project rehearsal. Photo by Blaine Truitt Covert. So what do you think, does it look like you'd expect? 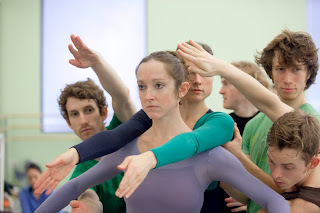 See the finished work in The Stravinsky Project opening February 26th. 1. At one point, Stravinsky lived in a Swiss hotel, but wouldn't compose there unless he was sure no one could hear him - which was rare. Later, a dealer set him up with a piano which was kept in a combination lumber storage-chicken coop. 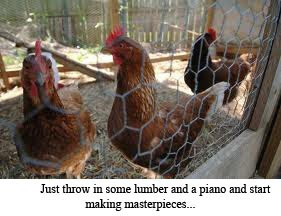 In the coop/lumber yard he composed some of his most famous works. 3. Stravinsky was known for ruthlessly promoting his music in order to support his lavish lifestyle. One of his triumphs was the inclusion of Rite of Spring in Walt Disney's Fantasia. 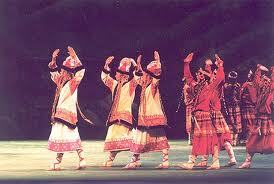 He also composed a commissioned work for dancing elephants which eventually become George Balanchine's Circus Polka. Stravinsky was able to negotiate a high commission from the circus for his composition. 4. The audience protest at the 1913 premiere of The Rite of Spring was so loud that neither the dancers nor the audience could properly hear the music. 5. Towards the end of his life, Stravinsky became especially fond of the game Scrabble. Bonus question: How many points is "Stravinsky" worth? Get all the Stravinsky you can handle at OBT's The Stravinsky Project opening February 26th. Fertile Ground 2011 is a ten-day arts festival celebrating new work by Portland artists. This year’s festival will feature over 50 Portland-generated new works, along with a myriad of other arts events from Portland’s creative community. From fully-staged world premieres in theatre, to ensemble and collaborative driven work, dance, comedy, visual art and film, this festival spans the spectrum of creative endeavor and seeds the next generation of creation through artist conversations, workshops, lunchtime readings and more. A Ghost In the Room With Us plays at 7 pm on Wednesday, January 26th and 6pm on Sunday, January 30th at Conduit (918 SW Yamhill, 4th Floor). Tickets are $15. More info here. 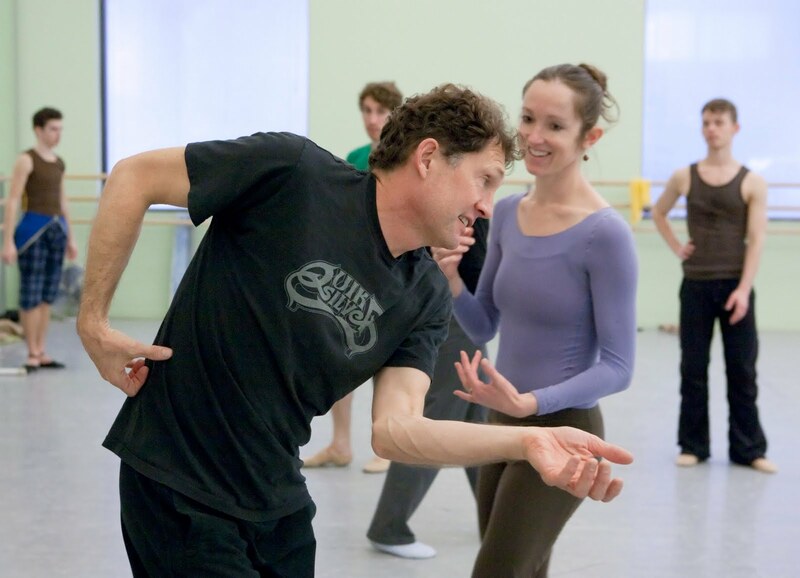 Gavin Larsen has danced with Pacific Northwest Ballet, Alberta Ballet, the Suzanne Farrell Ballet, Ballet Victoria and most recently as a principal dancer with Oregon Ballet Theatre. 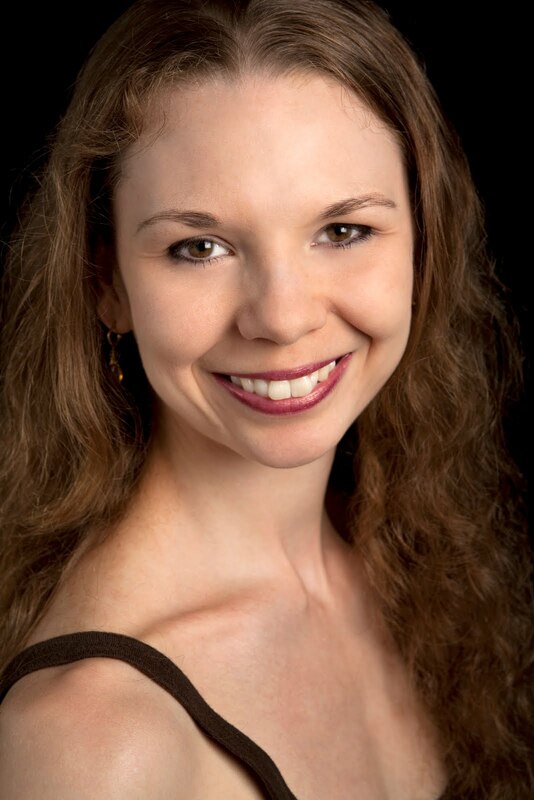 She is thrilled to continue exploring the limitless language of dance by incorporating, considering, and learning from the distinct dialects of her fellow artists and collaborators, David Biespiel and Joshua Pearl. Gavin is currently on the faculty of the School of Oregon Ballet Theatre. 1. A Choreographer I Admire Is . . . I admire anyone with the bravery to create dance! 1. Tell us about your Fertile Ground Festival project. Three of us, poet David Biespiel, dancer Gavin Larsen, and musician Joshua Pearl — the trio that call themselves Incorporamento — are returning to the Fertile Ground Festival with a collaboration of original poetry, dance, and music, “A Ghost in the Room with Us.” Building on last year’s heralded Fertile Ground performance, we’re trying to allow audiences to interpret performance in a new way. We’re defining and fusing the lines between three classic forms of art. “A Ghost in the Room with Us” burns with recollection, introspection, and meditative reverie in a fabulous performance of renewal, insight, and pleasure. 2. How did this piece come about? What inspired it? As soon as last year’s FG Festival shows ended, we were already talking about what we would do next. We knew we wanted to move to a more polished and fully produced show, much more in-depth, and include both original and existing work. We kept meeting to have “jam sessions” all spring and summer, and the pieces in this show are the results. 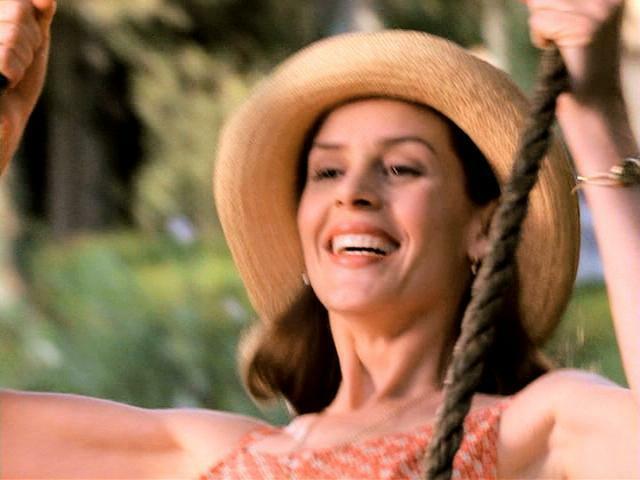 We’re inspired by the concept of noticing that inner self that we all have, who travels with us through life, but is often as mysterious and effervescent as a ghost. We each work independently, and then bring something to the table, so to speak, at each rehearsal. Some of our pieces were born from the seed of a piece of music, some from one of David’s poems, and some from my movement. We blend them together without stepping all over each other’s work. 4. What is the most exciting/inspiring piece of live performance you’ve seen in Portland? Honestly, it’s some of the OBT performances that I have either performed in or seen my colleagues do. I am routinely floored by the amount of talent and creativity in these studios. 5. What are you up to these days when you’re not creating? I teach full-time at the School of OBT and coach the children that appear in any OBT production, so that has kept me very busy all fall and winter. When I’m not doing that, I’m refreshing my soul by moving my body and trying to live up to the high creative standards of Joshua and David. Doing this FG performance is like getting a drink of water after a long thirsty spell. I can’t stop gulping it down! We are so proud to have so many OBT artists presenting work for the Fertile Ground Festival. Get your tickets or festival passes today! Tell us what you think - What's the best part of seeing a world premiere performance?